Karen is a multitalented singer/songwriter/musician who has a huge love for the work she does and her positive energy onstage is electric! She has an extensive background in piano, dance, and acting, and this has helped her bring a higher level of musicianship to her singing and a great energy and dance aesthetic to her performing work. Karen is also a classically trained pianist who grew up in a houseful of music - her mother being a classical pianist and composer, and her father being a bluegrass musician and singer, (upright bass & Mandolin). She got her start as a performer playing piano and singing harmony with her Dad's band at the age of 6. : ) She went on to win several national classical piano competitions during her high school years and began college as a piano performance major. After realizing that as much as she loved piano, she was a people person, and was not built for 8 hours a day of solitary practice. This led her to spread her wings in other creative areas she loved: voice, dance, and acting, and started her on the path that led her to where she is today. As an original artist Karen has performed extensively throughout the NYC area and has always strived for excellence in her songwriting. 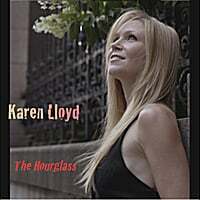 She has just finished the long awaited CD “The Hourglass”, which she wrote, arranged, and produced, as well as playing many of the instruments on it. She says, “This was a real labor of love for me!” When I was younger I had so many people telling me what to write, what would sell, how to market myself etc. that I felt a bit lost at times. I felt it was time for me to do a “record” that was all me – from top to bottom and to say what I wanted to say in my own way so this record is that and was very liberating!” “The Hourglass” is filled with powerful, expansive, moving songs that take the listener on a wonderful journey. She's toured as a background vocalist with Billy Joel, Elton John, and Enrique Iglesias. On the Enrique tour she had the pleasure of being the assistant choreographer to Toni Basil as well as being the vocal musical director. Karen had the opportunity to perform the steamy Whitney Houston duet "Could I have this kiss" every night on tour with Enrique. Other noteworthy singers that she has performed with include: Celine Dion, Marc Anthony, Garth Brooks, Tony Bennett, Jessica Simpson, Trisha Yearwood, Billy Gillman, Gloria Estephan, Natalie Cole, Taylor Dayne, Michael Fienstein, Eliie Lawson, Tom Jones, Donny Osmond, Gloria Gaynor, and even Rosie O'Donnell. Some noteable performances include: ", Macy's 4th of July Fireworks Spectacular TV Special; "Party in the Park" Televised concert in London for 110,000 people; "Top of the Pops" TV show (London) live, unplugged BBC Radio Special; "Jingle Ball 2002" - Boston, NYC, Philly; MTV - "Total Request Live"; "Last Call with Carson Daily", "Rosie O'Donnell Show" , "Today Show" , "Letterman", "Leno" , "Regis and Kelly". Karen also writes, records, engineers, and produces music in her Logic Pro studio for various artists, songwriters, corporate, and commercial projects and is also comfortable in doing remote record sessions when neccessary. See the K-Lo Studios page for more info on her studio, including gear, instruments, etc. As a vocalist, you have heard her most recently singing backgrounds on the hit TV show "SMASH". This was an awesome opportunity getting to work with the Grammy/Tony winning composer Marc Shaiman. Karen had the opportunity to work with Ennio Morricone as one of the singers on the "Mission to Mars" Film Soundtrack. You have also heard her as the singing and VO voice on the Doublemint Twins recent commercials, the Totinos commercials "We're the Kids in America", the Samantha Brown travel channel show theme as well as the singer on all the current Progressive Insurance radio spots. Other commercials you can hear her on include: on Ponds, Target, Walmart, Hertz, Lifesavers, Chase Bank, Commit, Budweiser, Nabisco, Planters, Always, commercials and too many more to mention. As a VO artist, you have heard Karen on numerous commercials, but some of her most fun VO opportunities have included: several recent Disney Ipad apps: "pooh's Birthday Surprise", and "Disney Princess Royal Party". Karen's the character voice on many video games, arcade games and even slot machines. She's the voice on the trams at Great Adventure, the voice on the LIRR escalators at Penn Station, as well as the VO on all the Long Island and DC buses announcing the destinations.